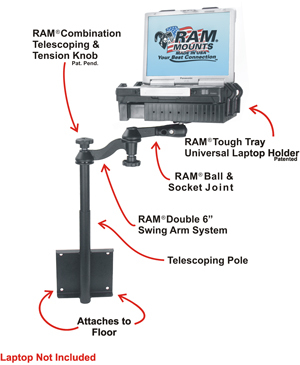 This sturdy universal fit Vertical Mount Laptop Stand can be easily installed in all vehicles. Made of heavy duty steel with a black powder coat finish. This stand includes many of the same features found on our No Drill™ Laptop Mounts. your mount to any flat vertical surface. Stands telescope to heights of 12" to 18" for comfortable use of your laptop. Dual aluminum swing arms provide articulation and 12" of reach for driver access. RAM’s patented rubber ball and socket joint provides additional adjustment as well as shock and vibration isolation. The RAM Tough Tray™ accommodates laptops 10" to 16" wide and comes with adjustable retaining arms with secure rubber grips that adjust from 5∕8" to 1 7∕8" high. This Vertical Mount Stand bolts to any vertical surface such as a cab partition, or an interior wall. All hardware included. The pre-drilled mounting plate measures 8"L x 8"W.